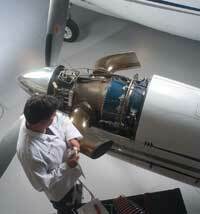 The PT6A Power Section has either a single-stage or a two-stage power turbine depending on model. For turboprop use, this powers a two-stage planetary output reduction gearbox, which turns the propeller at a speed of 1,900 to 2,200 rpm. The exhaust gas then escapes through two side-mounted ducts in the power turbine housing or exhaust duct. For more information on PT6A Power Section inspections or maintenance, please contact Rocky Mountain Turbine Services today at 970.252.0864 or fill out our simple form by clicking the request a quote button on this page.